The 2018 NFL Draft features an interesting group of quarterbacks, with as many as five likely to be taken in the first round. Given the diverse group of skill sets within that group, a number of NFL teams chasing a new franchise quarterback need to nail their evaluation of that group and make the right choice. The coming weeks are going to be full of every possible metric applied to these players, including the battery of athletic measurables that will come from the NFL Scouting Combine in Indianapolis. There is no greater indicator of what a player can do in the NFL though than what he has just done throughout his college career, and as it happens, PFF has graded every snap from these players since the 2014 college season. That isn’t to say that great college players always become great NFL players – we know that isn’t the case and can all think of countless examples to prove that point – but when a player ticks all the relevant athletic measurables boxes, as well as checks out off the field, the best place to see their game in action is their college tape. From what we have seen on the field, Oklahoma’s Baker Mayfield is the best quarterback in this draft class, and it isn’t particularly close to the second guy. 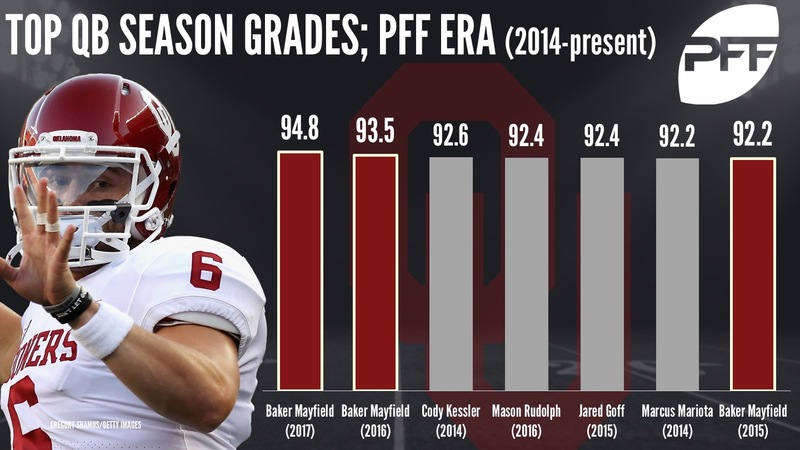 Mayfield owns the best two single-season PFF grades we have seen in four years of college grading and three of the top six seasons. Every number you choose to focus on puts Mayfield head and shoulders above the rest of the class. His NFL passer rating when kept clean in the pocket was 143.8 in 2017, more than 20.0 points higher than any of the other potential top quarterbacks. Of course, playing from a clean pocket is like playing a game of Madden on ‘Rookie’ mode, but it is the more stable metric when it comes to predicting future performance. 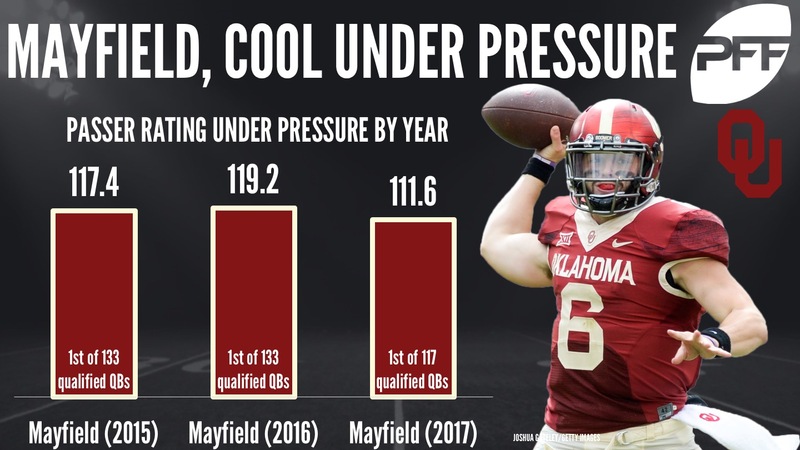 Pressure by its nature can cause chaotic plays, and while throwing from a clean pocket is only looking at play under ideal circumstances, it is a much more stable baseline, and Mayfield’s line under those optimum conditions is in a different league to the rest of the class. If we look at the less ideal circumstances though – play under pressure as well – Mayfield again dominates. Under pressure, his passer rating was 111.6 in 2017. He was the only one of those top prospects to have a rating higher than 100 when pressured, and that rating of 111.6 is actually a higher number than four of the other top six quarterback when kept clean in the pocket. Mayfield was more productive and efficient when pressured than the other top prospects were when kept clean in 2017. In the NFL, pressure typically causes around a 34-point drop in passer rating over large enough sample sizes, taking the average quarterback’s passer rating down from the 90s into the 60s, so for Mayfield to have a passer rating of 111.6 or above on those plays is phenomenal, even in college, and that was the lowest rating of the past three seasons of play. Over the past three years he has ranked first in the nation in passer rating under pressure each season, and combined, his passer rating under pressure for those three seasons was 116.1. But everybody knows that Mayfield’s numbers are a product of a quirky college offense that just relies on screens and manufactured yardage from his receivers, right? College spread offenses are the bane of NFL evaluators, and there is no doubt that Oklahoma’s offense does manufacture some cheap and easy yardage for Mayfield, but that doesn’t come close to telling the whole story. The PFF Analytics team has been doing some work on quantifying what ‘NFL throws’ are, and looking at how college prospects relate to those throws. In essence, they have isolated the throws that have the highest expected points added (EPA) and are of the highest variance in terms of quarterback performance on them – i.e. good quarterbacks are good at making those throws, while bad quarterbacks are not. This past season, Mayfield had the eighth-most ‘NFL throw’ attempts in the nation and by far the best grade of any college quarterback on those pass attempts. This is not a player that was simply the product of a gimmick offense putting defenses in ugly situations and benefitting from routine and easy throws every down. Of course, as is the case with Mayfield in almost all circumstances, he also had one of the best grades in the nation on non-NFL throws as well. Again, Mayfield is just excellent across the board. Much of the negative comments surrounding Mayfield’s prospects in the NFL center around his physical stature and tools, but even that seems to be short changing him. Mayfield was listed at 6-foot-1 at Oklahoma, and the Senior Bowl measurements confirmed that as a generous college exaggeration. He measured just over 6-foot even, and weighed 216-pounds. 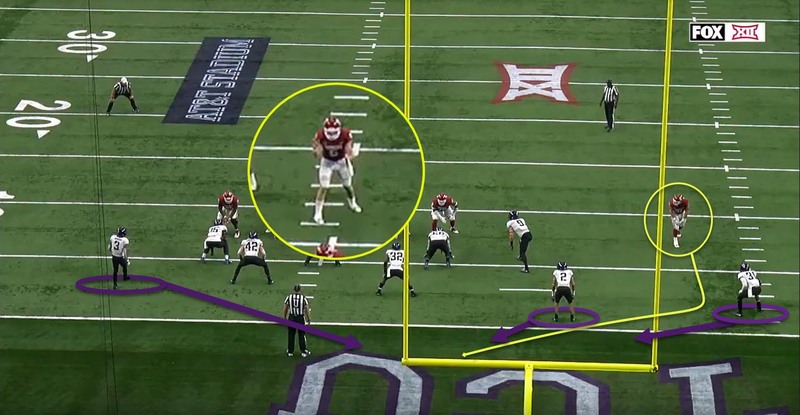 That he cleared six feet is a big deal for some, but no matter where in that range he fell, Mayfield has always been an undersized quarterback. He is though an almost identical height/weight analogue for Russell Wilson (5-foot-11, 215-pounds), who hasn’t found problems operating at quarterback in the NFL. Wilson is of course the exception rather than the rule, but for Mayfield to dominate the college grading in the way he has, he is already the exception at the college level. Of course, practical arm strength is more often relevant on shorter, intermediate passes – the ability to drive the ball with velocity into tight windows or on off-platform throws. Mayfield has plenty of those in his tape as well, and if anything, appears to have one of the stronger arms in this class when it comes to fundamental passing velocity. When it comes to arm talent, Wyoming’s Josh Allen is the top prospect in this class from a pure power and velocity standpoint, but the ball charting data from Zebra Technologies at the Senior Bowl showed Mayfield consistently in the same ballpark in terms of miles per hour of passes and revolutions per minute of the football, both combined showing a pretty good picture of ball velocity and arm strength. Mayfield also offsets some of the concerns about his stature with his athleticism, just as Wilson does. He’s not the same athlete that Wilson is, though it will be interesting to see how close he comes to that measurable profile in pre-draft workouts, but he can make significant plays with his legs and more importantly use that to escape initial pressure and find himself a pass to make later in the play. Mayfield gets a lot of comparisons to Johnny Manziel, but the most fundamental flaw in this parallel is that when Mayfield takes off, he is looking to buy time to create a play within the offense, Manziel was scrambling to run, or to heave a deep bomb and little else. There is design to Mayfield’s movement behind the line of scrimmage, while Manziel was pure sandlot. Take this pass as an example. Mayfield is able to avoid initial pressure, make a good cut upfield to avoid running into a defender, and while most quarterbacks would have tucked the ball and be looking to pick up whatever yardage on the ground they can at this point, Mayfield finds a receiver and is able to zip the ball on the run to complete the pass. Perhaps the biggest unknowns with Baker Mayfield lie in his off-field concerns and attitude. A video of him being tackled to the ground by a cop during an arrest went viral and he has rubbed many people the wrong way with incidents such as planting a flag on Ohio State’s field, jawing with the opposition or firing a football at the head of an opposing player as he was jogging around Oklahoma’s end zone during warmups. That fiery nature could equally be a positive though, and as much as we have come to expect quarterbacks today to be bland and benign, saying nothing that will offend anybody, that competitive spirit can galvanise teammates and be spectacular to watch. His biggest perceived negatives may in fact be positives, and that’s a thought that has been echoed in NFL front offices, though by no means universally, as Mayfield remains an incredibly polarizing prospect. NFL teams will be the best placed people to evaluate Mayfield’s personality and how that relates to a locker room, as well as how big of a problem any off field concerns may be, isolating evaluation to his performance on the field, there is no quarterback that can come close to the level of dominance we have seen from Mayfield over his college career, and if that were the only criteria, he would be the No.1 overall pick in April’s draft.